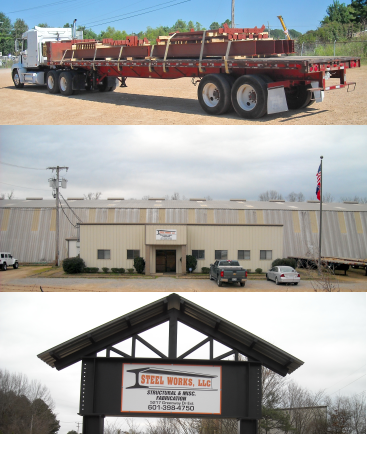 Steel Works, LLC, is the preferred steel contractor for our customers throughout the world's construction and manufacturing industries. 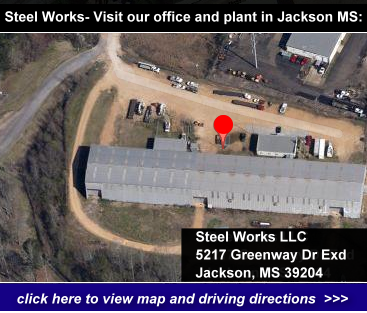 Now located in Jackson, Mississippi, Steel Works LLC, has been providing structural and miscellaneous steel fabrication for commercial and industrial applications since 2006. We provide complete services for the fabrication of structural and miscellaneous steel for a wide variety of construction, such as: Retail, Office Buildings, Schools, Medical Buildings and Industrial Complexes. We are a full service provider which furnishes all structural steel, joist and decking, and miscellaneous stairs and railings with very competitive pricing and fast delivery. We are locally owned and operated. Our goal is to create and develop a long term relationship with our customers by providing a quality product in a timely manner. Our work is not complete until all our customer’s needs and requirements are met to their complete satisfaction. We ask for the opportunity to serve you. Learn more about our officers and view our company directory here. Copyright 2014 - Steel Works LLC - All Rights Reserved | Steel Works is a steel manufacturer in Jackson Mississippi.